If Org 2 has an overall theme, it’s “resonance”. Today’s post has a very simple message. Atoms with lone pairs, π bonds, radicals, and carbocations can participate in resonance: atoms that lack any of these features cannot. 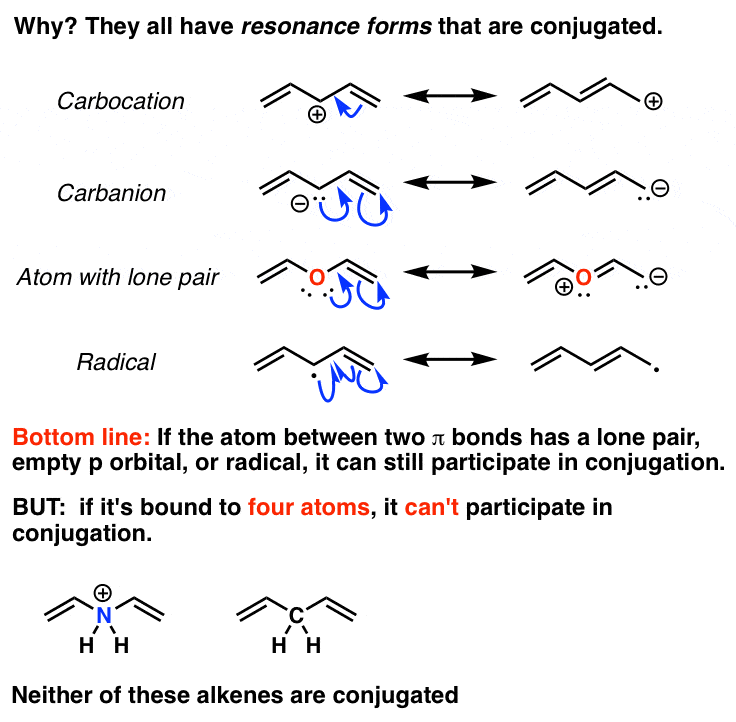 One way in which this comes up is in determining whether two alkenes are “conjugated” or not. A full discussion of conjugation is for another time, but “conjugation” is the name we give for the phenomenon where π electrons (that is, “electrons in p orbitals”) can be shared over more than 3 or more atoms. 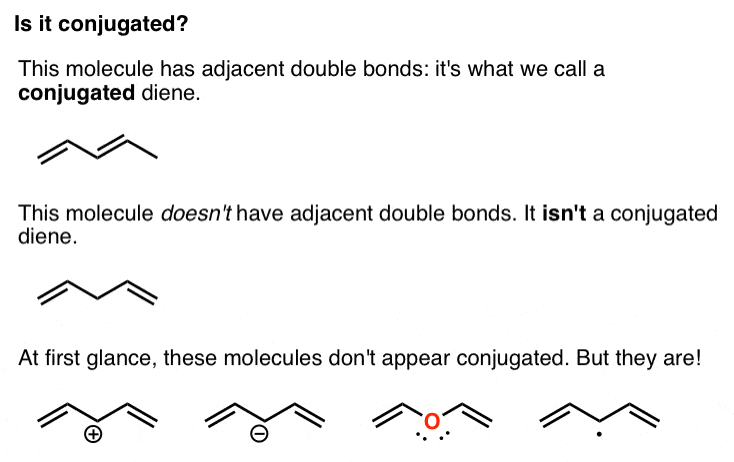 Here’s an example of a conjugated diene and a non-conjugated dienes. In each of these we can draw resonance forms where the middle atom participates in a π bond. This implies that the electrons are being shared (“delocalized”) between this central atom and the alkenes on the side, and thus the whole system is ‘conjugated’. Why does this matter, you may ask? Because some day, I have a hunch that you might be asked whether the following rings are conjugated or not, and you might need to come up with a good answer…. I love your posts, they’re always informative! Thanks! Thank you for your posts!!! AND your website! I love that I’m able to access all the information for free. I’ve been struggling with chemistry for a very long time. Your website is very helpful! Thank you so much! I am in Orgo II right now and am struggling but these really help me a lot! Glad it was helpful Danielle! Thank you for helping me remember my Chemistry! I’m so glad you put the “exceptions” to the rule on your posts. My teacher always forgets to tell us when the rule doesn’t apply, and I always come to your blog to gain a better understanding of the material. Thanks! Whats the answers to the structure above. So all of it can form resonance except the first one? For the purposes of determining aromaticity, the first one is not conjugated all the way around the ring. The others are. Thank you so much for this great resource! Thanks for helping to understand conjugated and not conjugated molecules. That’s something you can google.